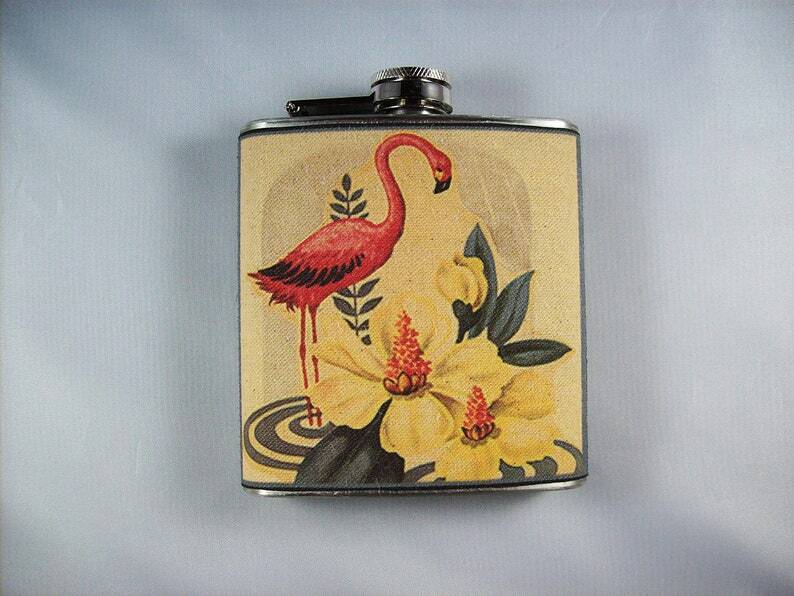 Go retro with my fabulous vintage style flask featuring a 1950s era pink flamingo on the front and a deco style crane on the back. A great gift for flamingo collectors or lovers of rockabilly kitsch. I make my flasks with a brand new 6 oz stainless steel flask. I start by transferring the image onto lightweight canvas. I then add 3 coats of scotch guard and adhere the canvas to the flask. The final result is a water and stain resistant product that will hold many a drink for your travels. I'm so very happy with my purchase!! I plan to come back for my next birthday gift! Great seller. Highly recommended. Thanks!